Some days are just magical. Saturday June 29th turned out to be one of them. As mentioned in the previous posting, I abandoned the Rincon Campground due to the high wind and inability to anchor my tent. In addition all the sites were reserved for Friday and Saturday night, so I needed to find a different location to camp, and I wasn’t sure where to look. The Arkansas River corridor is very popular at this time of the year due to the high river flows and the white water rafting crowd so I returned home to Denver on Friday night, but I didn’t give up on the idea of fishing on Saturday since Jane was scheduled to play tennis with her group that is getting ready for summer league play. 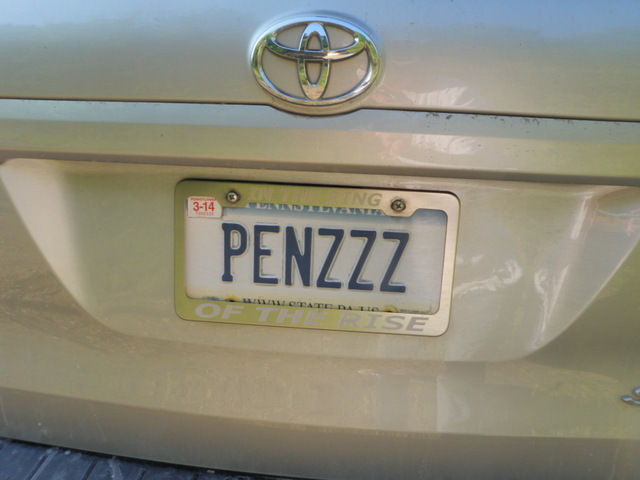 The question churning through my mind was where could I fish within a reasonable drive from Denver? I began my search by reviewing the Colorado DWS web site which logs stream flows. I checked South Boulder Creek below Gross Reservoir and the water was raging at close to 400 cfs. Clear Creek was rushing down the mountain at 500 cfs. 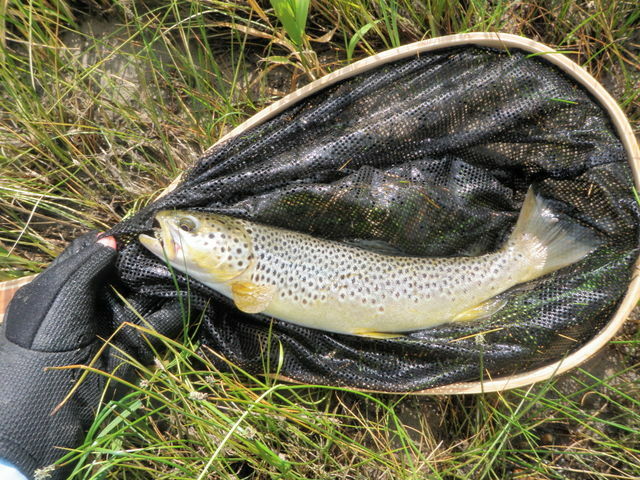 Small Bear Creek was an option at 27 cfs, but it is very small, receives a fair amount of pressure and contains small fish. The Big Thompson below Lake Estes was clearly an option with steady flows at 128 cfs, and I’ve fished successfully at this level, but it is quite popular and frustrating to find space particularly on weekends. The South Platte at Deckers continues to run at very low levels with flows at 100 cfs at Deckers. This makes for difficult low clear water fishing and also can stress the fish. The North Fork of St. Vrain below Buttonrock Dam was listed at 93 cfs so this peaked my interest. 93 cfs, although high, is still a level that can be fished comfortably; however, another source listed the North Fork at 151 cfs. I decided to make the NF of the St. Vrain River or Creek my destination and set out at 7:45. The drive was uneventful and I arrived at the gate parking area by 8:45 and quickly put on my waders, set up my Loomis five weight rod, and stuffed my water, raincoat and lunch in my backpack. I hiked the mile or so up the dirt road at a brisk pace as I targeted the stretch of water above the lower outlet pipe. I knew from previous experience that the water is released from the base of the dam, but additional water shoots into the stream from a narrow chute and culvert half a mile below the dam. I’m guessing the 93 cfs is the flow between the dam and the point where the second release enters. This proved to be a great strategy as the water above the pipe was much more manageable than below. I planned to fish to the dam, and then if time remained, retreat to a point where the road crossed the stream and try the stretch with more volume. I recalled from previous years that the Chernobyl ant was productive on the St. Vrain and I liked the idea of a large buoyant foam attractor as my top fly. Beneath the Chernobyl I added a beadhead hares ear nymph and because the flows were fairly robust, I extended the leader to over three feet. At the tail of the large pool where I began, a twelve inch brown smashed the hares ear nymph and my fun day began. Another smaller brown smashed the Chernobyl ant at the top of the long deep pool and I was wondering if my good fortune was the product of the nice pool I began in, or would it continue in more marginal water? I moved on and began drawing fish to the surface in all the likely places plus more marginal spots along the bank. That’s right, to the surface. Most of the fish were attacking the Chernobyl ant with conviction. Because I was wearing my polarized sunglasses I could see fish move at least two feet to inhale the large gaudy ant pattern. 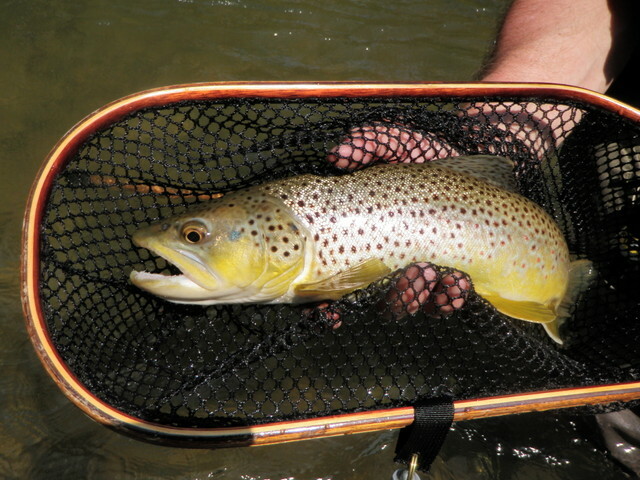 In addition it was thrilling to observe large swirls when browns crashed the low floating foam fly in the deep slots and seams along heavy current. These fish were also fairly nice sized browns by St. Vrain standards, and I landed quite a few chunky browns in the 13 and even 14 inch range. The one downside was that many of the fish would create a massive tangle of the trailing line and dropper fly when they struck the top fly and then twisted and turned to escape the hook set. I debated removing the dropper several times, but each time I was about to pull the trigger, a fish would grab the hares ear, and I continued with the risk of tangle frustration. My fish count climbed into the twenties and I was having a blast prospecting my two flies in all the likely locations as I moved up along the right bank. My focus was somewhat interrupted by the sound of thunder and the appearance of large gray clouds to the west, so I decided to find a pleasant spot on the bank and eat my lunch. I observed the water during my lunch break, but didn’t see any significant insect activity, so I resumed with the two flies that produced for me all morning. A short time after lunch the sky darkened even more, and I returned to the bank to put on my raincoat as a preemptive move. It was also at this time that I noticed some pale morning duns in the air. I never saw any on the water nor did I see any fish rise, but I decided to swap the hares ear for a pheasant tail in an effort to more closely imitate the pale morning dun nymph. Amazingly this proved to be a great strategy and my catches over the remainder of the afternoon were split in a roughly 50/50 ratio between the Chernobyl ant and the beadhead pheasant tail. There were a few situations where I saw a fish rise almost the instant my flies hit the water and I assumed the Chernoyl ant was the target only to discover upon netting that the fish consumed the nymph. I’ve commented on this before, but I continue to be amazed by it. In one instance I cast the flies to a place where a current angled from next to the bank back into a deeper area next to some main current. The angled run couldn’t have been more that two feet deep, but as I watched I saw a nice brown slide over from the bank position, move two feet and then grab the trailing pheasant tail. I love visual action such as this. Of course the exciting swirls and smashes of the Chernobyl ant continued in addition to the subsurface pheasant tail ambushes. By three o’clock I reached the stretch of water below the settling pool of the dam and the wind blew a gentle mist toward me and also toward the east. Since it was already 3PM and I’d landed 36 fish I decided to call it quits and hike back down the road to my waiting Santa Fe. What a day! I wasn’t sure I’d be able to fish the stream other than some small pockets along the edge, and I ended up landing 36 wild fish in a .5 mile stretch, and fly selection was about as easy as it gets. I’m assuming that the flows only recently dropped to the 93 cfs level and the fish are quite hungry after a month of high levels. Anything that looks like food is to their liking, and they aren’t spending a lot of time being particular. 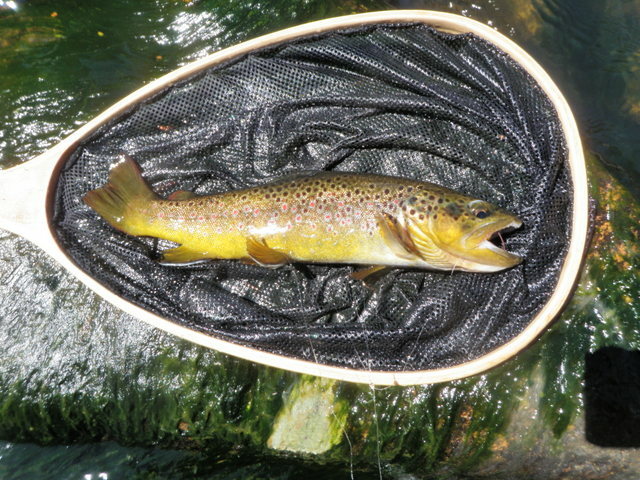 Even a flashy oversized Chernobyl ant looks like a tasty meal to these famished St. Vrain brown trout. Heat. 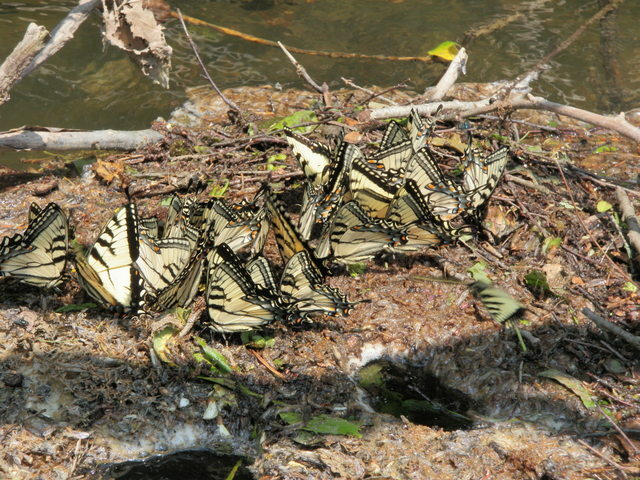 That is what I will remember the most about my trip to the Arkansas River on June 27 and 28. It was one of the few times in my life when I was set up for some fishing, but I was too hot to actually do it. I wrapped up the financial package for May at Saddleback Design on Wednesday so that I was in a position to go fishing on Friday and Saturday. Jane agreed to play tennis with her teammate in the summer league on Saturday morning, so Saturday was available for some fishing and I anxiously reviewed the streamflows and reports from the fly shops. Even though the snow pack was below normal in 2013, it was still much greater than 2012, and deep enough to create runoff on many Colorado Rivers. I noted that the Arkansas River had dropped to just under 700 cfs and the Eagle River was averaging around 600 cfs. I checked these first because they are freestone rivers and fish best as runoff declines and then become more difficult once they level out and resume summer flows. 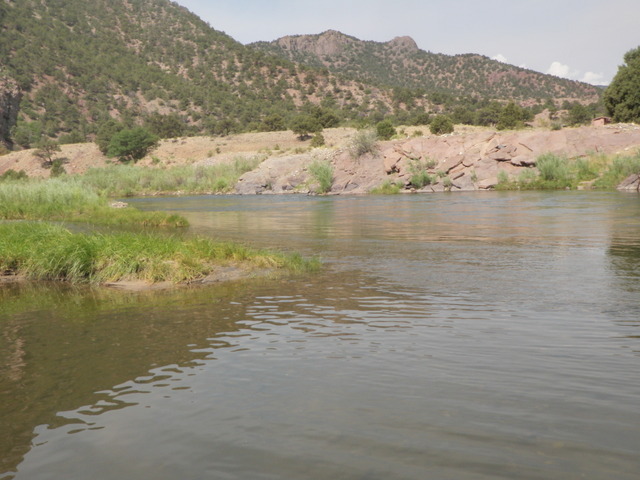 I’ve experienced some success fishing the edges on the Arkansas River when the flows are up, but I was concerned that 700 was already too low for the type of fishing where the trout are all pushed to the bank to seek relief from the strong flows of the main river. The Eagle River at 600 is still a bit high and difficult to fish. The reports on the Arkansas from Royal Gorge Anglers and ArkAnglers were typically upbeat, but I checked the reports of Cutthroat Anglers in Dillon, CO, a shop that isn’t very close to either the Eagle River or the Arkansas River, and it rated the Arkansas as four stars and “on fire”. This clinched my decision and I made plans to fish the Arkansas on Friday and Saturday. I had a dermatology appointment on Thursday morning at 8:45AM, so I planned to pack the Santa Fe afterwards and then drive to the Arkansas River below Salida and find a campsite and fish Thursday evening as well as Friday and Saturday. Unfortunately I had two biopsies taken by the dermatologist on Thursday morning thus requiring bandages, an additional complication I was not planning on. One of the spots removed was on the back of my left hand, and it was a location where a band-aid did not adhere very well. I packed the car and was on my way by 11:15 and arrived at the first campground below Salida by 2:30PM. Unfortunately this campground was quite primitive with no fire pits or picnic tables, so I decided to move on to Rincon as I remembered this to be a more official campground. Meanwhile it was a very hot day with temperatures reaching the mid-90’s in Denver and probably the low 90’s around Salida, but I was cruising along in my air conditioned vehicle and oblivious to the heat around me. When I arrived at Rincon I quickly found an open campsite next to the river and paid for two nights, but this turned out to be a mistake. The sites were actually fairly nice although there was no shade whatsoever and the tent pad and area around the picnic table and fire pit was covered with a thick layer of gravel. This was actually quite nice for preventing tracking dirt into the tent and car, but it afforded no opportunity for driving a tent stake into the ground. I began the task of setting up my tent in the peak late afternoon sun. Normally I can erect the REI two person tent in 15 minutes, but that would not be the case on Thursday, June 27. I forgot that the center pole of the rain fly needed to run through the center hook of the main tent, so I struggled for awhile trying to follow the directions on this step. While focusing on this last step, some strong gusts of wind began to sweep up along the river. I quickly staked out the main tent, but as I mentioned there was virtually zero penetration of the tent stakes into solid ground. A stronger gust of wind came along and tumbled the tent over a couple times and I quickly rescued it from rolling into the river. Meanwhile the bandage on the back of my hand kept sliding loose due to perspiration and all the hand movement, and I was concerned about keeping it clean and preventing infection. There were numerous large boulders scattered about the tent pad area, so I grabbed one and tied the rope around the rock to anchor the tent instead of using the tent stake. I also threw my sleeping bag, pillow, pad and clothing bag in the tent to provide more ballast against the strong wind. Alas, even this was not enough and another gust of wind tumbled the entire tent including all my contents. 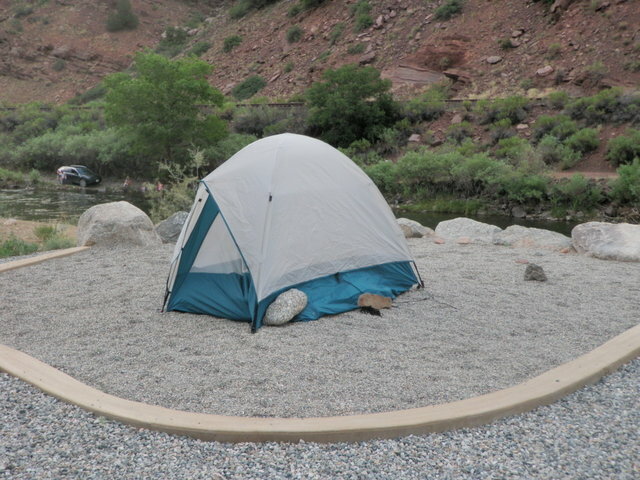 It was about this time that the occupants of the neighboring campsite arrived, and a gentleman walked over and told me that their neighbors the previous two nights had similar problems with their tent, and that explained all the boulders scattered about the tent pad. He held the tent against the relentless wind while I tossed four boulders the size of bowling balls into the tent to anchor all the corners. I then placed two more boulders on top of the outside edge of the tent on the side facing into the wind. After over an hour of frustration, my tent now withstood the steady hot wind blowing upriver, albeit with a strong lean. At this point I was exhausted from standing in the sun and the heat and fighting the wind and stressing over how to attach the rain fly, so I set up my stool in the shade of the Santa Fe and filled my plastic cup with a large handful of ice. The water from the blue container was so warm that it melted the ice almost instantly. I drained three large 16 ounce cups of ice water while I read an article in my fishing magazine. I planned to fish after 6PM, but I was feeling extremely drowsy, so I decided to go inside the tent and lie down. After all, the tent did provide some shade from the intense sun. But as you can imagine the heat and the wind resulted in a long nap, and when I awoke, I decided to make dinner before dark and bypass evening fishing. I had positioned myself for bonus fishing time, and now I didn’t feel like taking advantage! After dinner I cleaned up the dishes and then took a walk along the river upstream from the campground. It was around 8:30 and the intense sun dropped behind the mountains to the west as I carefully observed the river. It was running high compared to my recent visits, but there were numerous attactive slack areas behind rocks and along the bank. At one point I looked down from high above and noticed a flurry of rises in a slow moving area off to the side of the strong mid-river current. I was tempted to return to the car for my fly rod and some twilight action, but it was now 8:45 and it would be nearly dark by the time I returned. In addtion accessing this area required negotiating a steep rough path from the highway down to the river. I returned to my tent and curled up between four boulders and fell asleep almost instantly. I awoke rather early on Friday morning and a somewhat cool breeze greeted me as the sun had not yet risen above the canyon wall on the opposite side of the river. 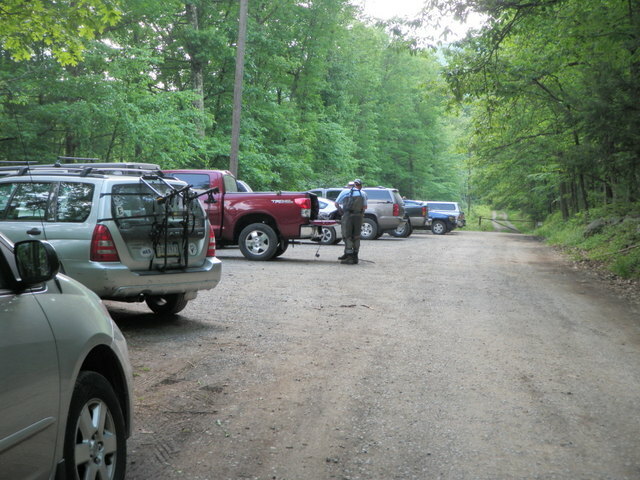 I prepared a quick breakfast and packed up all my gear and moved the Santa Fe to a parking lot at the end of the campground intended for fishermen and rafters. I did not plan to go through the windstorm again on Friday, and I called Jane to let her know that I was bailing early and would be home Friday evening after fishing.The positive to the Rincon camping experience was that I was packed up, in my waders and ready to fish by 8AM on Friday, a welcome circumstance since it was forecast to be another hot one on the Arkansas River. 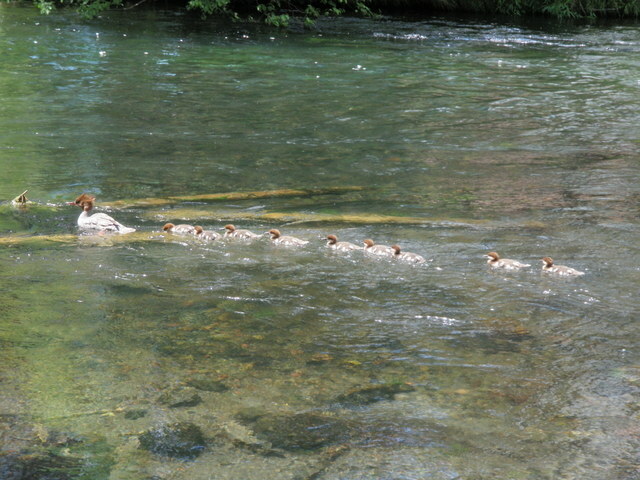 I waded into the cool river next to the campground and began casting my Loomis five weight with a Pool Toy yellow hopper and a beadhead hares ear. The Loomis handles large flies better than my Sage and Orvis rods as it flexes more in the tip section and slings larger weighty flies with ease. I worked my way upstream covering the slower moving areas with three to five casts and then moving on. At some point in the first hour I hooked two fish for a split second but failed to land, and the inability to finish was due to inattentiveness on my part. Sometime between 9 and 10 I encountered a huge rock that bordered the river and forced me to circle up and around on the bank. As I descended back to a nice looking pocket along the bank in front of the large rock I was forced to make a large step down from one ledge rock to another three feet above the river. When I reached my right foot down I couldn’t touch so I had to made a small aerial drop, but as I executed this I bumped my left side against another rock and lost my balance. I felt like I was in slow motion as I tucked my right shoulder and somehow released my rod from harms way. My legs flipped around and I remember seeing their shadows against the rock wall. In an instant I landed in the water and found my footing but not before some cold river water spilled over the top of my waders. For the first time on this trip I was actually feeling cool and refreshed. I considered returning to the car for a change of clothing, but knowing the hot temperatures ahead of me, I decided to continue fishing in my wet suit and enjoy the cooling effect of the evaporation. I moved on and encountered some nice pockets along the edge, but continued to go without any fish. 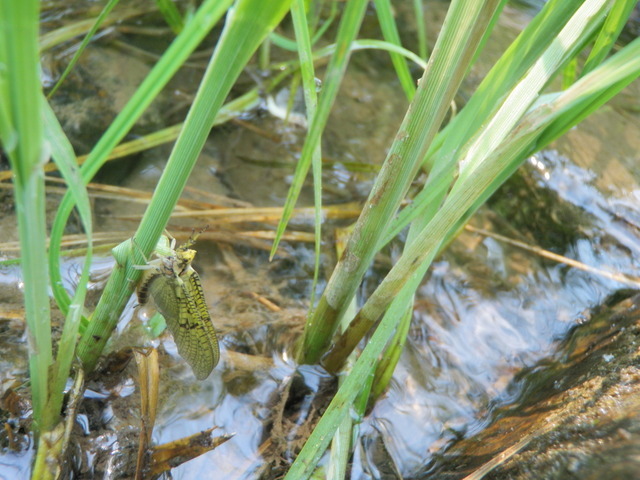 I spotted a solitary golden stonefly fluttering over the water, so I exchanged the pool toy for a size 10 yellow Letort hopper, but maintained the hares ear as the dropper fly. 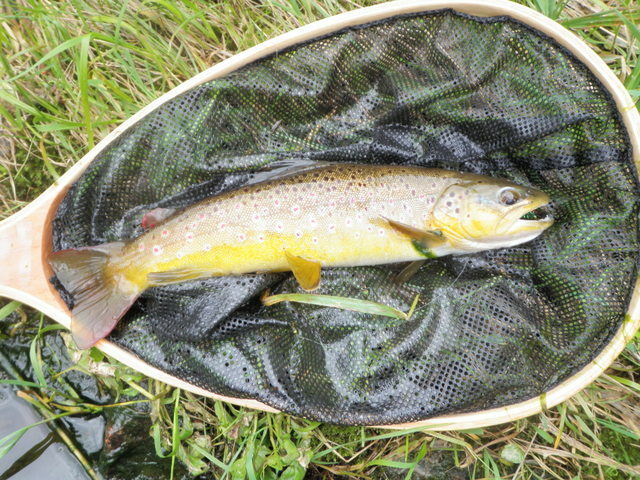 This didn’t change my fortunes and eventually I decided to abandon the dry dropper and try a size 14 dark olive caddis. During my walk the previous evening I noticed clouds of caddis around me and swiped one from the air and discovered a dark olive body. The dark olive caddis turned the tide and I began to catch fish at a fairly regular rate from 10:30 until around 1:30PM. The fish were in the 9-11 inch range with an occasional 12-13 incher, but I was enjoying the fairly consistent action. When I reached the area where I’d observed rises the previous evening, I landed a couple fish, but also spotted several nice size fish right along the bank that I spooked in my efforts to manuever upstream around the shrubs and rocks. At around 12:30 I climbed the bank to circle around a large rock and a big tree and as I came down the other side I found a nice deep narrow slot along the bank between two large exposed boulders. Not wanting to scare any fish, I stopped 10 feet up the bank and flicked a cast to the edge of the slot. Wham! Immediately a trout rose and smashed the caddis, but as I tried to pressure it to bring it back upstream, the line snapped where I’d connected the tippet with a surgeon’s knot. This was the fourth dark olive caddis I’d lost during the morning, and only one remained in my frontpack, so I decided to return to the car and restock. Upon my return from the car I continued working up along the left bank through some very juicy runs and pockets and reached eleven trout landed by 1:30. At this point I reached a nice deep run that fed into a twenty-five foot long pool, and here I began to see refusals to the caddis. At the same time I spotted a few pale morning duns drifting up from the river, so I tied on a light gray comparadun, but this also failed to produce. Next I opted for a light gray size 16 caddis, and this prompted more refusals so I moved on. I moved around a large bend in the river and found myself across from two modern day prospectors. 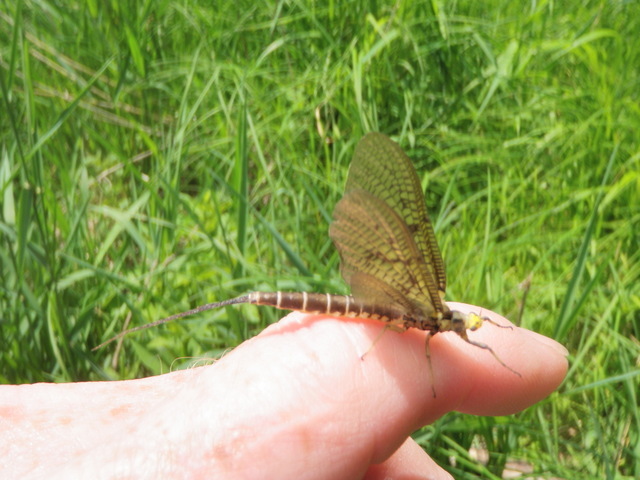 I also noticed three or four golden stoneflies flying above the river in their lumbering bomber style, so I paused to return to the yellow Letort hopper and added a beadhead pheasant tail dropper 18 inches below the hopper. Hopefully the narrow profile of my hopper would imitate the stoneflies present, and the pheasant tail would represent the nymph stage of pale morning duns. As I paused to reconfigure my flies, I gazed across the river to the prospectors and watched their routine. I’m sure they felt that climbing rocks along the river in the afternoon heat in waders and flailing away repeatedly was a boring activity, but what they were doing was even worse in my view. They were shoveling dirt from a bank twenty yards away from the river into a pan and then stooping over the river and adding water and swishing around the dirt looking for gold particles. I have no idea if they were succeeding enough to make it worth their while, but it looked like a horribly hot activity, and they had two tents set up so they appeared to be using their vacation for multiple days of gold panning. The move back to the hopper and beadhead pheasant tail paid dividends as I landed four more browns over the remainder of the afternoon before quitting at 3PM. Two were quite nice browns that grabbed the nymph as it drifted very tight to the rocks. The best fish was a beautiful rainbow that nailed the pheasant tail at the tail of a pocket as I lifted to recast. I fought the fish for 3-5 minutes, and in the process obtained some good looks at a fish that probably went between 15 and 20 inches. One of the prospectors across the river watched the battle and yelled out an admiring comment. Unfortunately late in the fight the rainbow got in some heavy current and make a quick turn and broke off the pheasant tail. I endured a lot of frustration, but it was worth it to be able to land fifteen wild brown trout on the Arkansas River with the river at 700 cfs and air temperatures hovering in the 80’s. As I expected, Colorado rivers should be in prime fishing condition by the Fourth of July in 2013. Having been skunked on the fabled Metolius River, I now felt a strong need to prove that I could catch at least one fish in the state of Oregon. I’ve proven that I can catch fish in Colorado, but what was it about Oregon that made me feel like a neophyte? 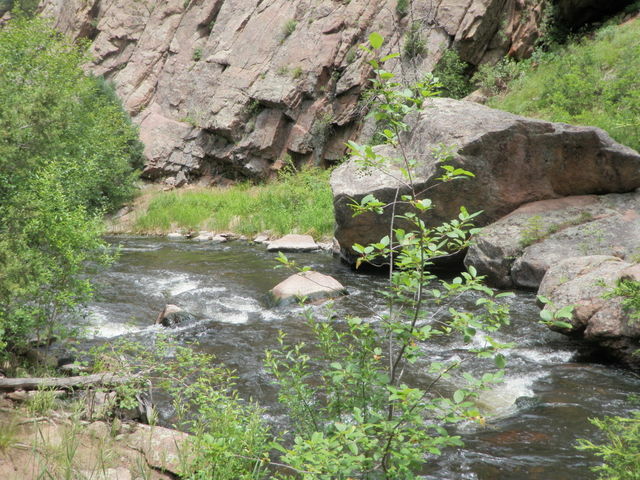 Oregon streams can’t be any more difficult than Penns Creek or the South Platte River in Cheesman Canyon. As I reminisced I realized that I landed only a few small fish on the Clackamas River in 2011 and one on the Deschutes, albeit a steelhead. I had to go back to 2002, when I had some big days on rivers in the northeast corner of Oregon while returning Amy to Whitman College, to recall any degree of success. Before leaving Amy’s house in Portland I printed a small brochure that listed fishing locations in Oregon with a small map. 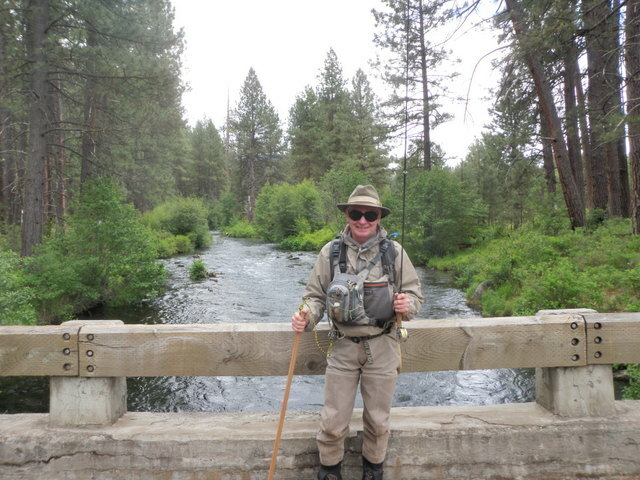 I began reading the brief descriptions of streams within a reasonable distance of the Metolius and settled on Crooked River near Prineville and the upper Deschutes River near Mt. Bachelor. The Deschutes in this area was described as a headwater with numerous brook trout, so this certainly sounded like an option where I could pad my numbers, but of course I was taking nothing for granted in Oregon. 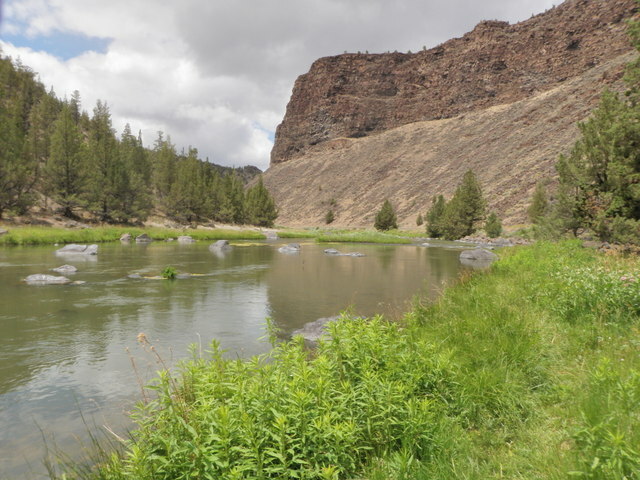 Crooked River was east of the Metolius and a tributary of the Deschutes and featured a 6-8 mile tailwater below the Prineville Dam where redband rainbow trout and whitefish were the predominant species. I liked the idea of catching native redbands, so chose this as my Wednesday destination. I whined enough about getting skunked that I apparently convinced the rest of the campers that they needed to transport me to Crooked River and dump me off to get a break for their ears. Amy, Jane and Joe decided to spend the rest of the day hiking at Smith Rock State Park after depositing me by the river. The stretch of river I targeted was approximately 60 miles away, so it took over an hour of driving. The trip was at least quite scenic and the terrain changed from forests to green grassy flats with much agriculture including cattle and wheat fields. We arrived at a wide pullout along the Crooked River at around noon and I grabbed all my gear and put on my waders and bid adieu to the others while descending a path to the river. I chose to stop in this area because I read the best fishing was between Castle Rock Campground and the dam and we’d just passed the campground. I observed numerous large exposed boulders in smooth pools linked by nice runs and pockets, and I usually prefer this type of water. It was a cool day with high temperatures projected in the sixties, and quite a few large gray clouds were visible in the western sky, so I wore my Adidas pullover and my raincoat over that. Initially I walked downstream a bit and cut over to the river at the top of a long smooth pool where some nice runs and current entered. The clouds blocked the sun and almost immediately I noticed rising fish. I wasn’t seeing anything on the water, but several fish were definitely feeding on the suface, so I chose a CDC BWO. Overcast skies and small flies that are nearly invisible usually point to blue wing olives. Unfortunately that rule apparently doesn’t apply to Oregon as I received numerous refusals and no fish. After quite a bit of unproductive casting I decided to move on and leave the frustration behind and I convinced myself that the fish that were rising were quite small. I moved upstream a bit to the nice runs and riffles and switched to a yellow Letort hopper with a beadhead hares ear; my typical beginning combination in Colorado. It didn’t take long before I hooked and landed a small whitefish and then a minnow sized rainbow that couldn’t have been more than two inches long. The day was beginning to play out similar to Tuesday on the Metolius. Next I resorted to nymphing and added a thingamabobber along with a weighted 20 incher for weight and then an orange scud. A gentleman that I chatted with on the Metolius across from our campsite told me that scuds and San Juan worms are effective on Crooked River. He was apparently fishing a different section or different time of year because these flies were ignored so I switched the orange scud for a Craven BWO emerger. 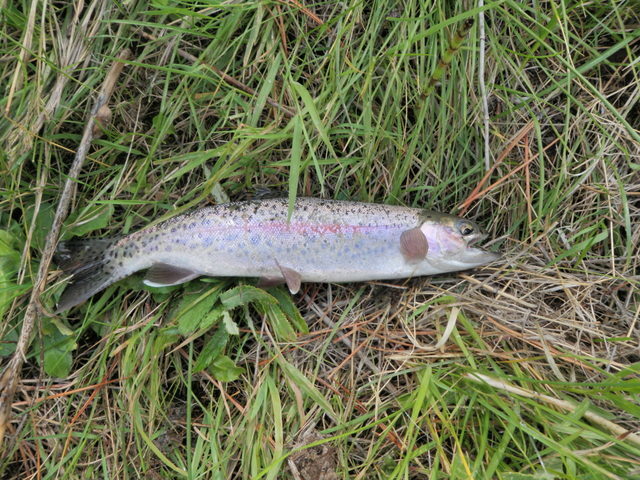 This finally did the trick and I hooked a rainbow that appeared to be around 10 inches, but as I played it, the fish dove into some heavy light green fibrous growth that was prevalent on the rocks of the Crooked River and got free. I was pretty frustrated at this point, as I still hadn’t landed a legitimate trout in Oregon on the trip. I persisted and waded to the opposite side of the river thinking that few fishermen go to the trouble of doing this. In short order I approached a small island and began walking up the bank next to the smaller right channel. As I gazed up the smooth water, I spotted a rise. I’d seen a few caddis fluttering about and the rise was not a sipping rise like the ones observed in the pool at the start, so I elected to remove the nymphs and try a light gray size 16 caddis. 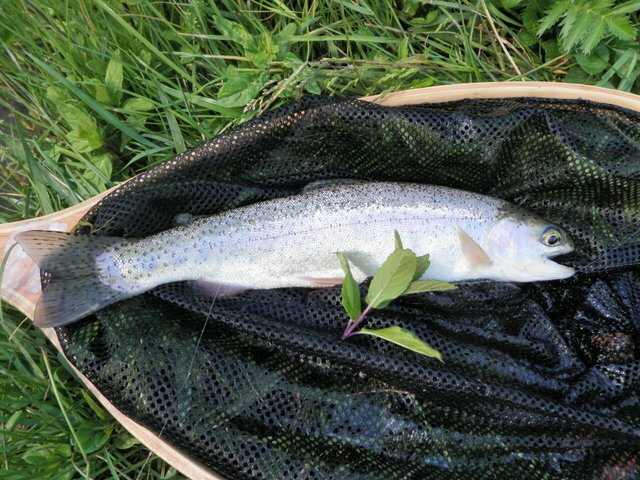 On the third drift a rainbow knifed to the surface and gulped my caddis imitation, and I carefully played and landed a ten inch rainbow and photographed my achievement. Perhaps I’d found the key on the Crooked River? I moved upstream a bit further and stumbled on the nicest stretch of water I would encounter on the day. A long riffle slid over moderate depth over the entire width of the river and fanned out into a deep long pool. I was stationed at the point where the riffle slowed down and dropped into the slower moving pool. Meanwhile some dark clouds once again moved above me and a brief shower ensued, and like clockwork fish began to rise directly across from me. Prior to the hatch I’d converted back to nymphs, and on one of my drifts about 10 feet across from me, a fish rose and inhaled the orange thingamabobber! I know for certain that it chomped on the orb because I instinctively set the hook and felt weight for a split second. What did this mean? Was there a hatch of small orange balls commencing? I searched my fly boxes for an orange fly and spotted an orange Madam X that I’d tied quite a few years ago so I removed the nymph rig and tied on the Madam X. Sure enough after a few drifts a seven inch rainbow rose and sucked in the size 12 orange Madam X. Clearly I was overanalyzing Oregon fishing! Unfortunately the number of fish rising increased, and they were ignoring the Madam X so I added a light gray comparadun trailing the Madam X. This was a nice setup for visibility and following my flies, but the fish were ignoring and the Madam X became waterlogged and began to sink. I clipped off the large attractor and used a single gray comparadun. This move elicited some refusals, but no takes, so I switched to a size 16 comparadun with a light yellow body that I’d tied for fishing to sulfurs in Pennsylvania. This did the trick one time and I landed another small rainbow, but then a string of refusals continued until the hatch ended when the sunshine returned. I’d now landed three small rainbows, and the rising fish at least gave me optimism. I continued upstream past another campground and a huge long slow moving pool to an island above the pool. Near the top of the pool I spotted a few sporadic rises and climbed down close the water to make some half hearted casts, but this did not produce. I was now searching for an exit strategy, in other words a place to cross back to the road and return to the pullout where I was scheduled to meet my transportation. I scouted the other side of the island and determined that I could wade to the island at the bottom end and then walk up the island to the top where I could cross the opposite channel. After executing this maneuver I hiked down the road toward the meeting place pullout. As I moved to the lower end of the long pool I noticed a couple strolling along the river bank and then I heard the woman began to screech something in a high pitched voice. A minute or two later I noticed a young dog on the opposite side of the river in the very spot where I’d landed two rainbows, and the spaniel or pointer appeared to be upset and unable to cross back to the side of the river of the approoaching owners. The woman yelled up to me and asked if there was a place to cross and I suggested the island above the long pool. I moved on and arrived at the meeting point slightly before 5PM, so I decided to return to the river by the pullout and fish until Amy, Jane and Joe arrived. I could see the arrival of any cars above me. I tied on a Chernobyl ant with a pink foam indicator, but the fly kept landing on the wrong side, so I swapped it for a yellow Chernobyl and beneath that attached a headhead hares ear. I began fishing, but before long I heard a car door slam, and then looked upstream to see the male portion of the couple with the dog. Apparently the boyfriend volunteered or was ordered to save the dog, and the young man was looking for a place to cross. I suggested the island to him, but also mentioned that I’d crossed somewhere between his current location and the long pool. I suggested that he obtain a strong stick before he made the attempt. 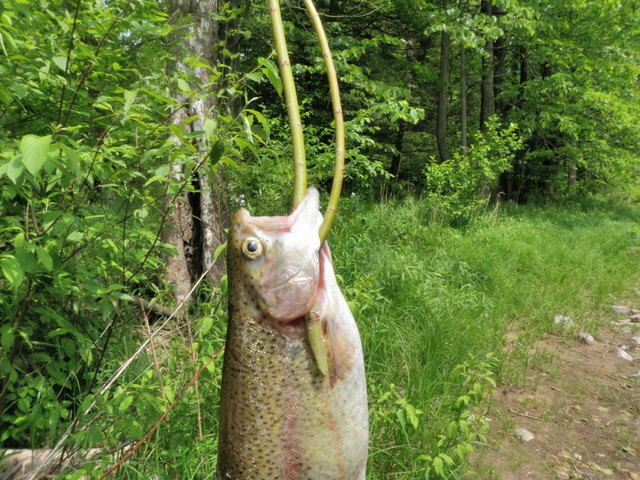 I refocused on my fishing and began prospecting the Chernobyl and BHHE, and eventually hooked and landed and photographed a ten inch rainbow that hit the BHHE on a swing in front of a large rock. In addition I landed another whitefish just before my family arrived and picked my up for the return trip. Location: Upper Metolius, upper edge of Gorge Campground to the Camp Sherman store. Challenging. Difficult. Educational. These are all adjectives I’ve read in reference to the Metolius River in central Oregon. The other descriptions, however, greatly intrigued me; a large spring creek with a steeper than normal gradient and significant hatches of western green drakes and golden stoneflies. These flies are large and easy to see on the water and usually bring large fish to the surface. Shortly after reading the latest magazine article on the Metolius River in Fly Fisherman magazine, my daughter Amy called and informed me that she and her boyfriend Joe camped at Riverside Campground along the Metolius River, and she characterized it as a beautiful location. This prompted Jane and I to make plans to fly to Oregon to visit Amy and spend a few days camping along the Metolius. Well, we waited quite a while but on June 17 our plans became reality. Jane and I flew from Denver to Portland on Fathers’ Day with backpacks and in my case, a large fishing bag. Amy picked us up at the airport and we spent Sunday night at her house in Portland where I was presented with a sturdy wading staff. 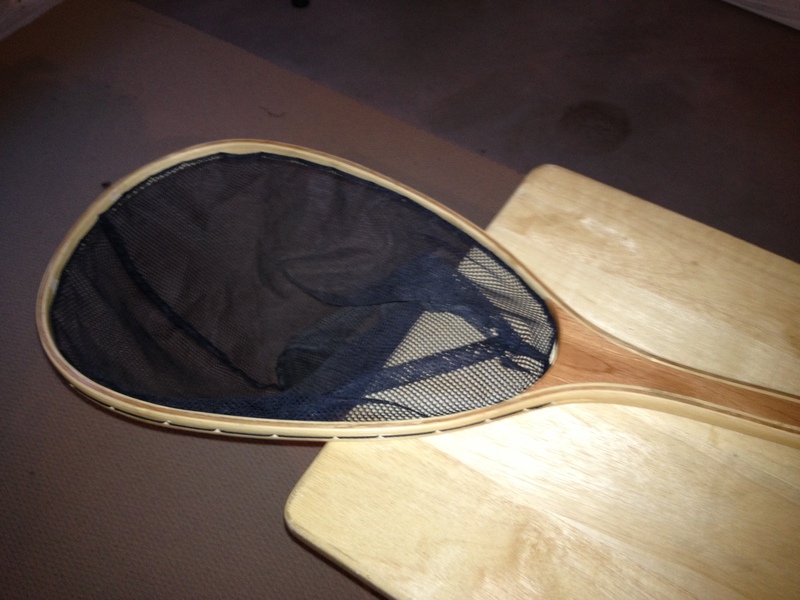 Amy purchased a hockey stick at a thrift shop and Joe helped her craft it into a fine wading tool. On Monday we visited the local supermarket and picked up necessary food supplies and then packed everything into Amy’s tiny Nissan Versa. It was quite an achievement to fit eveything in the small hatchback along with three human beings. Joe would drive up separately on his Ducati motorcycle as he was scheduled to work until 2:30PM on Monday afternoon. The trip was uneventful until we remembered that we neglected to pack the camp stove and lantern that Amy rented from Portland State University. Amy was able to connect with Joe prior to his departure, and he managed to somehow fit the two extra items into the boxes on his motorcycle. 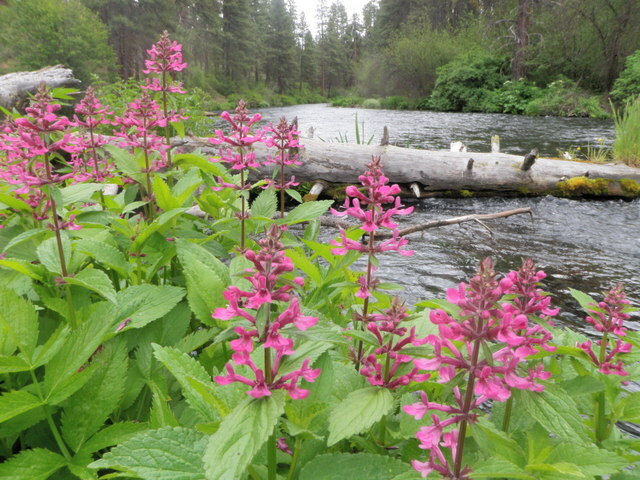 There are quite a few national forest service campgrounds along the Metolius, but we selected the only one on the north side of the river and it was named Lower Canyon Creek. It was a bit tricky to find, but after asking directions at the Camp Sherman Store and obtaining a detailed map, we found our chosen destination. It was a beautiful spot where Canyon Creek merged with the Metolius River forming a huge junction pool right next to our site. We unpacked the car and put up our two person tents and then explored the West Metolius Trail as the trailhead was at the end of our campground. 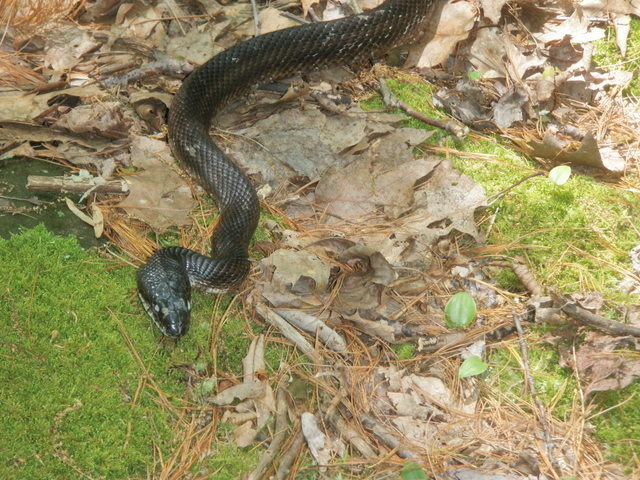 Amazingly there were no other campers to contend with at Canyon Creek during our entire stay. We hiked perhaps a mile down the trail and .5 mile downstream discovered a place where a huge spring gushed from the lava rock bank and augmented the flow of the river by perhaps 25%. The water was cold and crystal clear and exhibited a rich aqua hue in many spots. From a fishing perspective there were only three spots that could be fished effiectively as the river flowed rapidly from bank to bank with much whitewater over most of the length we hiked. I reviewed the Metolius article again and again, and it mentioned that the upper river was smaller and less difficult, but yielded smaller fish, so I elected to target that water on Tuesday. Amy, Jane and Joe decided to take a hike on Tuesday so they dropped me off on the upper river. I carefully sorted additional flies into my patch and fleece and small boxes as I would not be able to return to the car. There was no margin for error on these drop off fly fishing adventures. 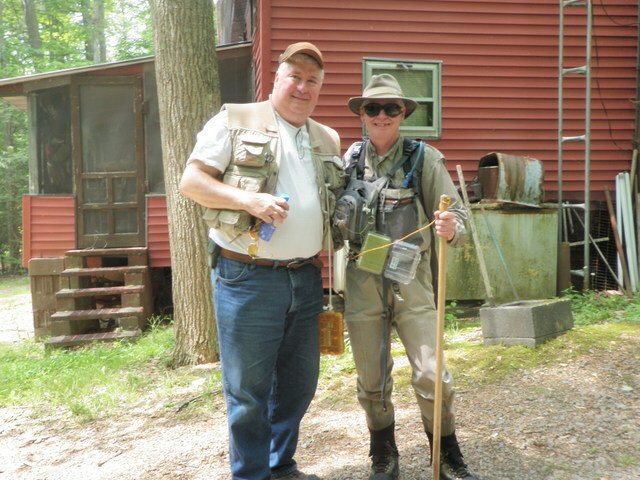 We stopped at the Camp Sherman store, and while Jane bought some supplies I wandered to the fly shop section, and an older gentleman was restocking the fly bins. I asked what stretch of water he would recommend and he suggested driving to the Allingham Bridge and fishing back up to the store. I also asked him about green drakes since the Fly Fisherman article stated that they hatch from late May until late June. I was disappointed to hear that I would not encounter green drakes on the upper river, that they were only emerging on the lower river. He did offer that PMD’s would likely hatch around 3PM if not sooner due to the overcast skies. We jumped back in the Versa and Amy drove me to Allingham Bridge where she took a photo and we said our goodbyes. I agreed to be at the parking lot outside the store by 4PM to be picked up. 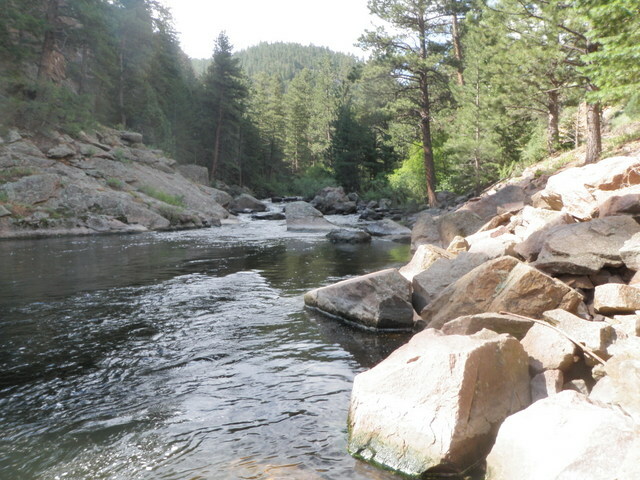 I was now on my own, and I decided to walk downstream another half mile or so since I wasn’t sure I’d have enough water to cover in five hours.The area was gorgeous with spaced out ponderosa pine trees and lush vegetation all along the river including numerous wildflowers. There were numerous nice runs and places where the river split around logs and small islands. Surely this would be a fun day of fishing. I decided to begin with a yellow Letort hopper trailing a salvation nymph. I was hoping that perhaps the size 10 hopper would represent an early golden stonefly and the salvation nymph would serve as either an attractor or imitation of a PMD nymph. I worked some attractive water as I moved upstream, but nothing was attacking my flies. In fact I was a bit surprised that I wasn’t even observing any fish scattering from the bank as I waded and progressed upstream. I swapped the salvation nymph for a beadhead hares ear in hopes this would cover more possibilities such as caddis pupa or PMD nymphs. This was a great thought, but again nothing was tempted by my offerings. Perhaps I needed to go deep due to the cold spring water, so I took the time to re-rig with a strike indicator and two nymphs. I read that split shot or the addition of external weight was prohibited in fly fishing only water in Oregon, so I tied on an Arkansas rubber leg as my top fly to add weight and below that I added a beadhead pheasant tail which is typically a more exact imitation of the PMD nymph. Once again I was stifled in my attempt to catch a fish. The Arkansas rubber leg wasn’t producing and was hanging up on the bottom more than I’d like, so I removed it and went to a beadhead hares ear on top with a beadhead pheasant tail on the bottom. This drifted better, but perhaps I wasn’t getting deep enough now. As time moved on I became less confident that I would catch a fish, but I persisted and after seeing quite a few midges hovering over the water, I exchanged the beadhead pheasant tail for a zebra midge. Finally at the end of a drift I felt a tap and set the hook and felt the weight of a small fish. I carefully played the precious catch as I was starved for a fish, but when I netted the shiny finned creature I was disappointed to discover an eight inch whitefish. At a few minutes before 3PM I began to notice sporadic pale morning duns rising from the current so I clipped off the nymphs and placed my fortunes on a light gray size 16 comparadun, a fly that historically produced well for me during pale morning dun hatches. It seemed futile to prospect randomly with this tiny fly, so I carefully observed the nice runs and slack areas for rising fish. Unfortunately I was not able to spot a rising fish during my entire five hours on the upper Metolius River. 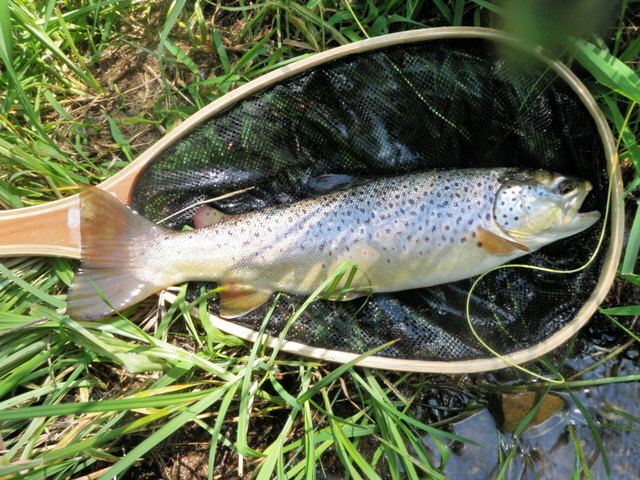 I cast the dry fly in particularly attractive locations, but fish were not looking to the surface. As 4PM approached I began to cover more stream and stopped only at exceptionally nice spots as I wanted to make sure I reached the store on time for my pick up. Alas, none of my strategies yielded any results, and I am forced to agree with all the adjectives that began this blog posting. 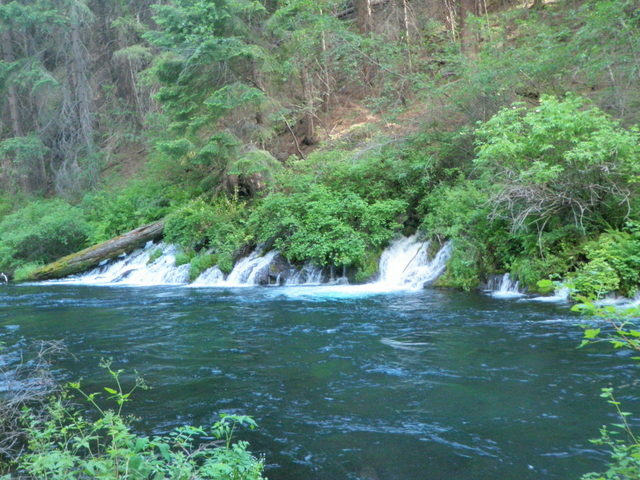 The Metolius is indeed a very difficult river especially to a newcomer with no experience. Perhaps a dense hatch would bring fish to the surface, and at least then I would feel like I had a fighting chance. Amy said that Oregon experienced a warmer drier spring than usual, so I’m guessing I missed the western green drakes for this reason. The Metolius River is a gorgeous yet humbling spot in central Oregon. ground in its futile attempts to escape. flapped its wings and faked like it was going to swoop toward us. our rescue efforts for awhile. This morning I performed some deeds that would make Jack Montgomery and PETA proud. My father-in-law Jack was known to trap mice alive in his house and then release them unharmed in his yard and of course we know what PETA stands for; People for the Ethical Treatment of Animals. As is my custom I carried my iTunes player and the sports section of the Denver Post downstairs this morning to complete my set of exercises on the Bowflex. For those who have never been to our house, there are three very deep window wells in the basement with walls approximately eight feet high. Midway through my routine of arm and chest exercises I glanced at the window well closest to me and spotted a tiny bunny rabbit with its nose pressed against the window. 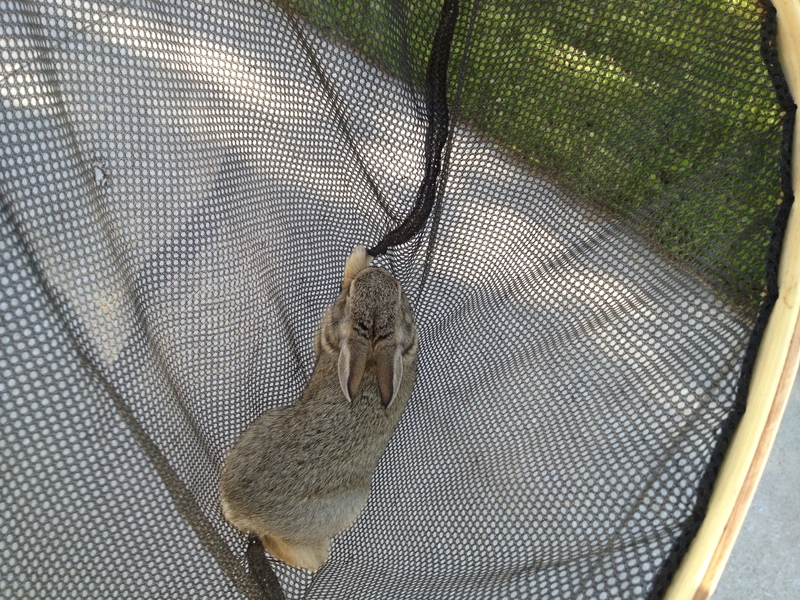 I continued on with my morning workout as I pondered ways to extract the fuzzy bunny from his or her predicament. I could open the window and remove the screen, but Jane had difficulty reinserting the screen in another window well, and I wasn’t sure I wanted to go through that difficulty. 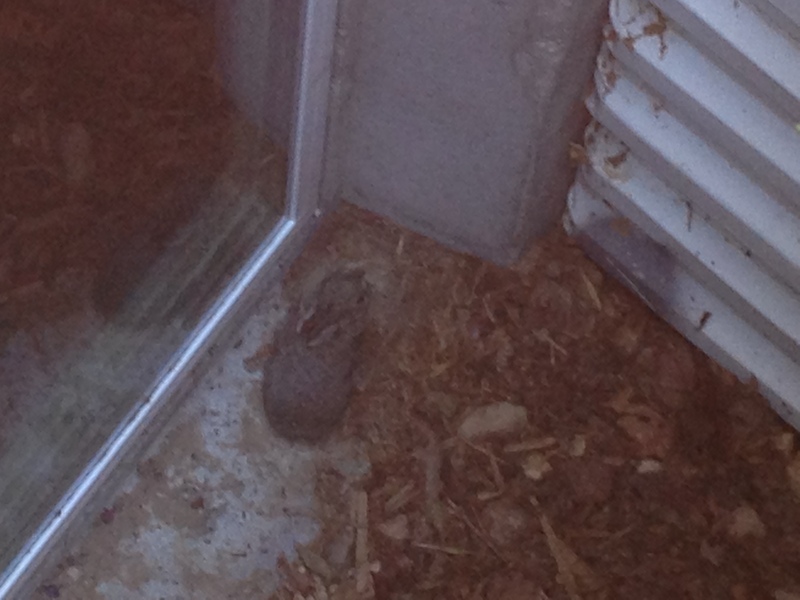 What could I lower into the deep window cavity that would allow the captive rabbit to be elevated back to ground level? As these thoughts were passing through my head, I was once again distracted by a cacophony of shrieking birds at one of the other window wells; the one where Jane had removed the screen and been unable to replace it. I wandered over to this window and much to my amazement there was a baby blackbird trapped in this window well. The small bird attempted to fly from the deep window well repeatedly but could only rise three to four feet before striking the walls and falling back to the ground. Meanwhile the mother and a host of related blackbirds hovered above the cavity and sqawked and shrieked like the world was coming to an end. Now my mind was diverted from the bunny to the distressed bird. The blackbirds must have built a nest in the Norwegian maple just behind the house because they have been relentlessly pestering our cat, Pip, for the last week. Amazingly they watch Pip’s every move even when he is within the house. Last night Pip moved from the great room to the front of the house, and I observed the adult blackbird fly by the side of the house so it could circle around and keep an eye on Pip while he was on the front side of the house. I surmise that somehow the bady bird tumbled from the nest in the maple tree and into the window well below and did not possess the requisite flying ability. I finished my workout and decided to proceed with an animal rescue strategy. I spotted one of Jane’s crutches leaning against the wall and considered lowering this into the window wells from outside, but I guessed that rabbits do not possess climbing ability like a squirrel. I glanced over to the pile of Dan’s belongings and noticed some skis…again probably too smooth, but what about a ski pole? 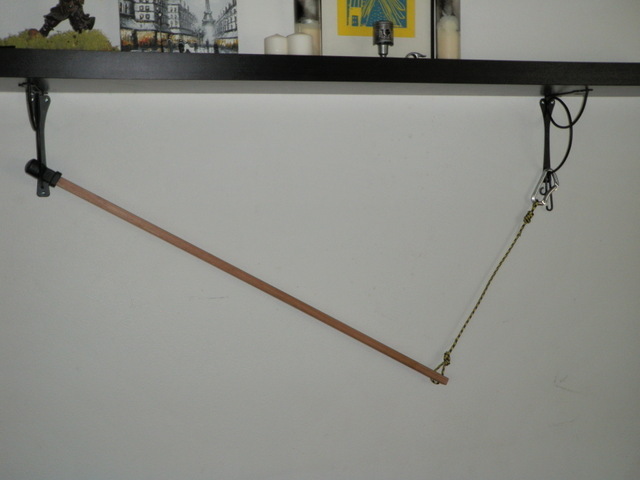 I had some extra long cross country ski poles in the garage and they had extra large baskets near the end. Could I elevate the bunny and bird by using the ski pole basket as a makeshift elevator platform? 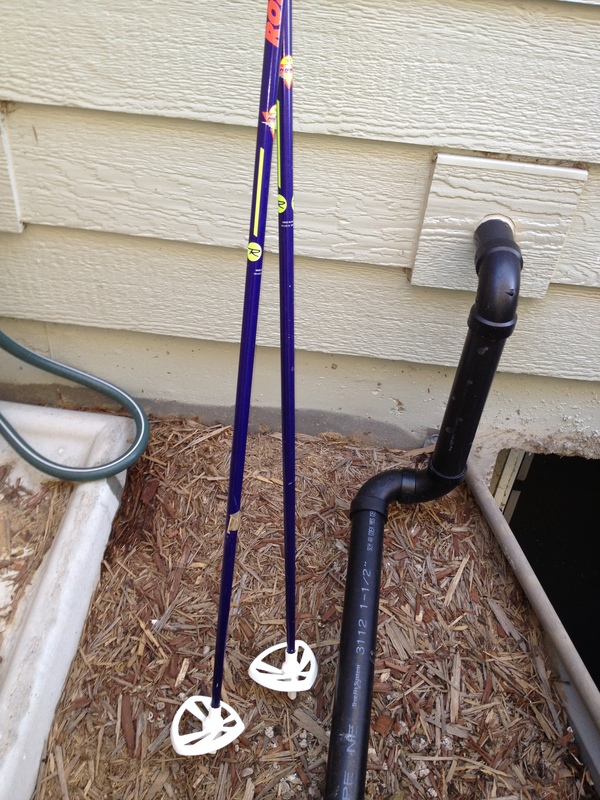 It was worth a try so I moved to the garage and retreived Jane’s ski poles as they had larger baskets. I circled around the front of the house to the window well along the side of the house and crouched on my knees and lowered the pair of long ski poles to the floor of the window well next to the scared bunny. I failed to allow for the 1.5 inch distance between the tip of the ski and the basket. The rabbit cowered in the corner on a cement ledge that surrounds the window and wouldn’t have anything to do with the escape platform being offered. Because the basket was an inch and a half above the tip, I couldn’t slide it under the little guy. I decided to temporarily abandon Mr. Bunny and move on to the feathered baby bird and its hovering not-so-friendly family. Once again I made a trip through the house and peered over the edge of the window well next to the patio and under the maple tree. The adults retreated to the tree only five feet away and resumed their raucous serenade while I lowered the ski poles to just below the small offspring. When the pole touched the little black feathered friend, it attempted to fly up in the same manner I’d witnessed, but before it could fall back, I followed with the ski pole and it temporarily perched on the basket and then resumed its attempt at flight. 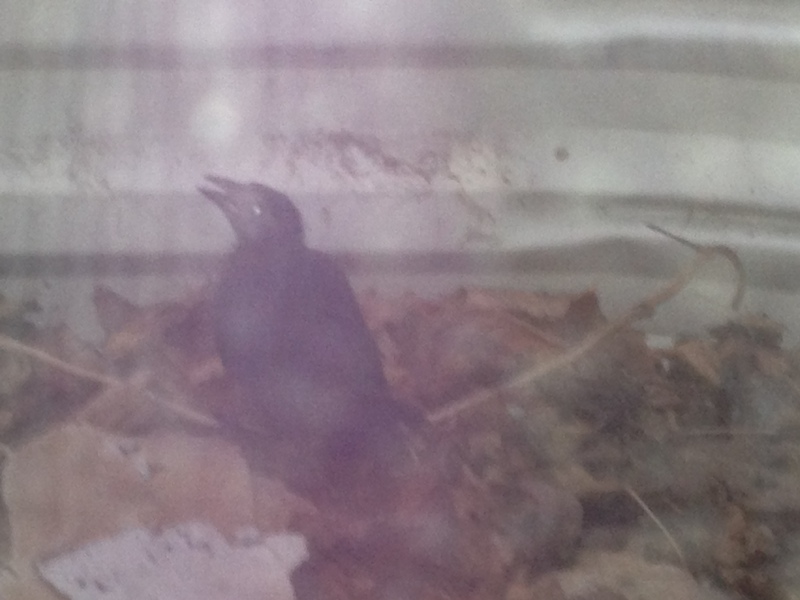 I was able to boost the bird enough so that its next attempt at flight catapulted it over the rim of the window well and on to the ground from whence it immediately scurried under the trumpet vine growing out of control in front of the air conditioner unit. My work here was done and it was now up to the helicopter mom to take over its parenting responsibilities. 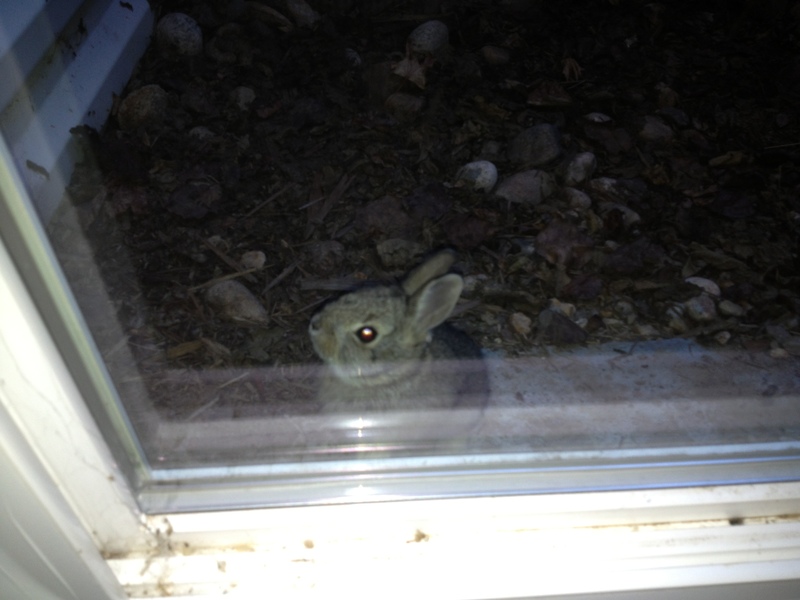 My thoughts returned to the sweet little bunny rabbit, and I quickly resigned myself to the need to open the window. But how would I prevent the quick little bunny from bounding into my basement? The thought of chasing a baby rabbit around the basement and under boxes, Christmas decorations and Dan’s life possessions was not appealing. In short order the vision of a fishing net flashed across my brain so I once again made a move to the garage and pulled down my $10 fishing net. I descended the stairs and unlocked the window and slid it open and then examined the screen. There were tiny black tabs and I pushed them outward and dislodged the screen from its position, and as I leaned the screen against the window wall, I grabbed my net and gently wedged it beneath the gray bunny and forced it to fall into the webbing. The rabbit made a futile attempt to escape the net, but I shook it so it nestled deeply in the pouch and quickly raced up the stairs and out the front door and then crossed the street to the greenbelt that separates 35th Avenue into east and westbound lanes. I released my furry friend next to an evergreen tree and and watched as it gleefully hopped to its freedom. My friend’s fate now depends on its youthful resourcefulness to survive in the wild, if one can refer to the Stapleton development as the wild.